I have the Hogwarts set, mostly for the novelty of a UK-style excursion train amongst my fleet (There was a UK steamer whose name escapes me at the moment that toured the US in the 1970's). I have extended my HE out to 9 cars in order to mimic the look of the excursion trains operated in the UK. I also have a pair of the TRAXX electrics play-acting as a freight electrification demonstrator. If any of the European high-speed trainsets were released in O' Id go for one, even though it would strain my storage capability. (There was a UK steamer whose name escapes me at the moment that toured the US in the 1970's). The Flying Scotsman toured the US and Canada in 1969-70 or 71. Unfortunately, it almost didn't make it back to Great Britain, so as much as I would love to see a British steam loco visit the US, it would probably be too risky. For the Paris-Istanbul video: I love it! It's amazing how much just a backdrop can do to provide an environment for trains to pass through. A layout devoted to the entire OE route (although there were several) does sound like an interesting idea. It's not as cool as having one operating, but there is a British streamlined 4-6-2 in the Green Bay railroad museum. It was used by General Eisenhower during WWII. Most of my European stuff has Been in g gauge. I've had lgb trains since the age of two and their focus on European stuff made it necessary to have European prototypes on the layout. Of course, today there are plenty of opportunities to model us trains in g, but we've become enchanted with Swiss narrow gauge, so all of our prototypes are of trains from that country. Most of our o gauge is if American prototypes, but I've added a mth crocodile and two axle wagons to our collection. I'd like to do Swiss o scale or even no1 scale, but it's not in the budget. Nor do I have the space. 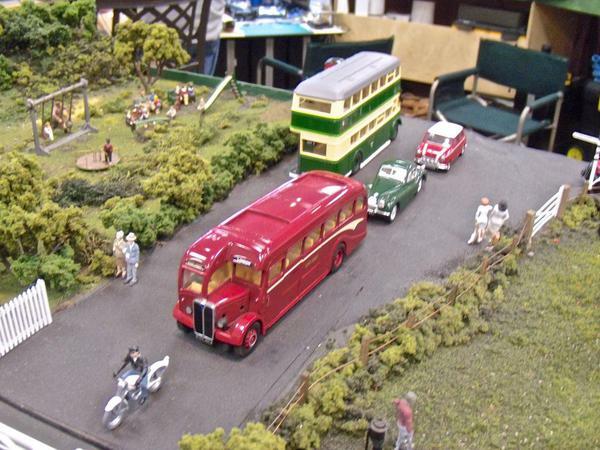 The Eastern New England chapter of the European Train Enthusiasts is a group that shows a European modular layout every January at the Big E Show in Springfield, Mass. They're always in the hall that's the closest to the parking lots. The layout is in HO, but it's excellent. I look forward to visiting it the whole day while walking the rest of the show. They're nice guys, too. If you're into European trains, be sure to look for them next time you go to the Big E.
Visited UK a couple of times, fell in love with LMS and predecessor lines. Have several pieces in OO. 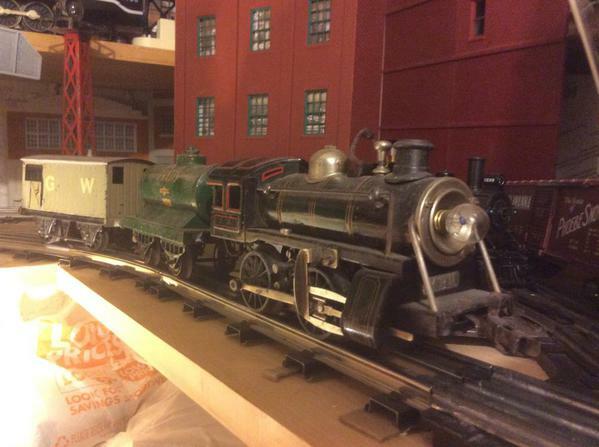 I look longingly at the MTH LMS Coronation 4-6-2, but I have too much equipment in O already. I made some videos of the European train enthusiasts at Springfield last year. Their layout is amazing. Note the features of this layout that you rarely see in ho scale here: tight radius curves and three rail track! 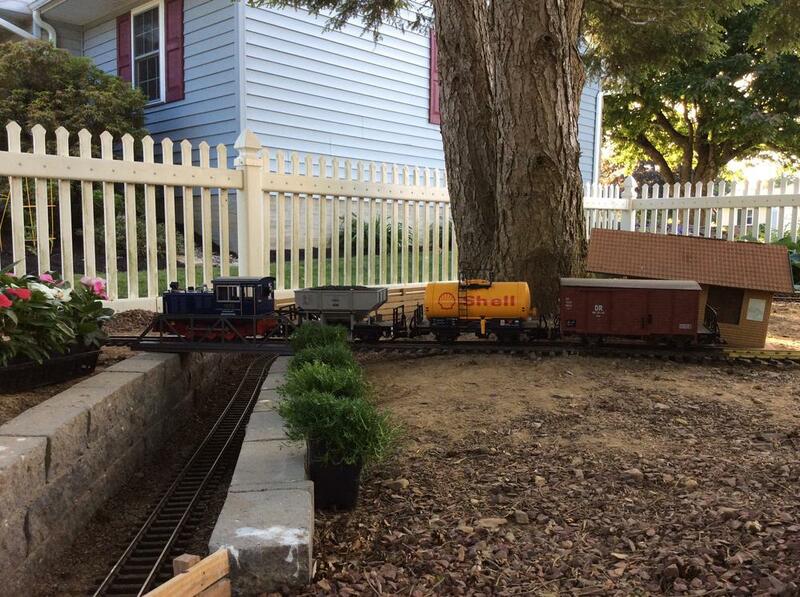 In many ways, European ho scale has a lot in common with our 3 rail scale in the us! Nice job lads! That was absolutely beautiful artwork!!! Reminded me of a similar mural that was in an old department store downtown. A show stopper! The crown area layering, skyline tint, and lighting blend is awesome. Pink, or peach fluorescent? 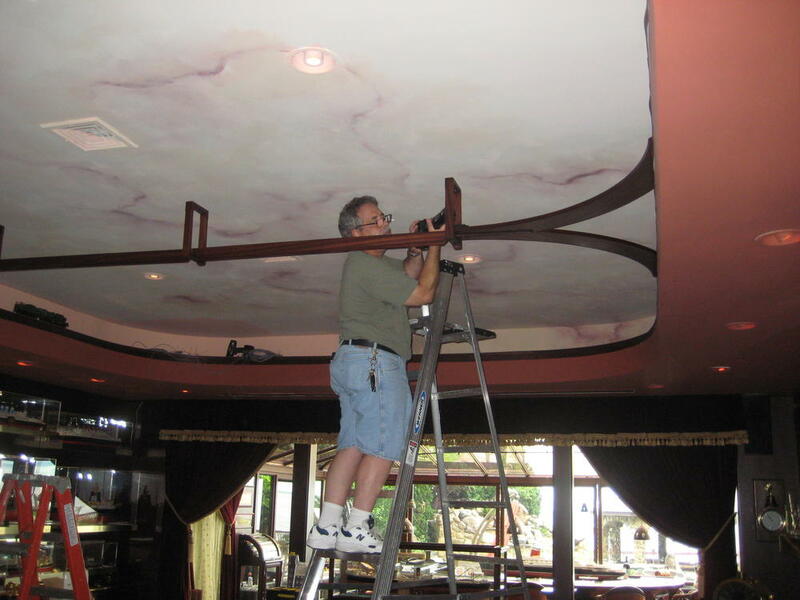 or is it all it the paint. On another note: from what I understand, modeling in Europe is a bit more exacting in that they model specific places more. Even on fictional railroads they will keep architecture, and trees etc. area correct for its more localized there. I think we call it 'scale' model railroading in the USA. I know guys that model a exact date, month, day and time!!!! 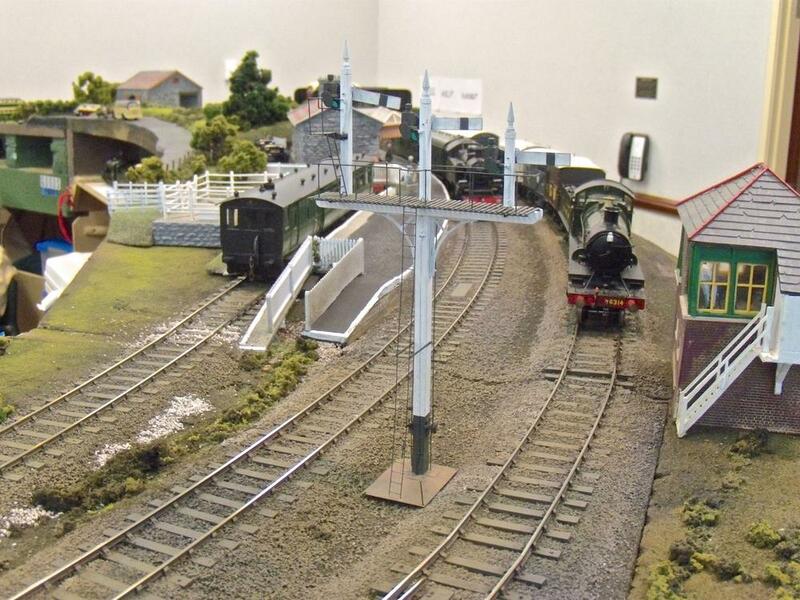 It is more in HO than O with our mix of traditional, semi scale, high rail and 3RS folks.....but still very common. My O 3r layout is set in 1954-57 in WV....so all buildings, trees etc etc have to fit that location and era. Hi everyone, just thought I would post a video of my Flying Hamburger. What scale is that Flying Hamburger? I have a collection of HO European engines and cars. I usually picked up a car or engine during travels to Europe. I have several friends who are members of the European Train Enthusiasts (ETE). They run Marklin HO and are very active in the SF Bay Area. There was a very nice O gauge 2-rail layout exhibited at O Scale West for a few years. The builders had moved to the USA (or perhaps Canada) from England. I have several friends who run European G gauge trains. Again, most of these people immigrated from Europe. 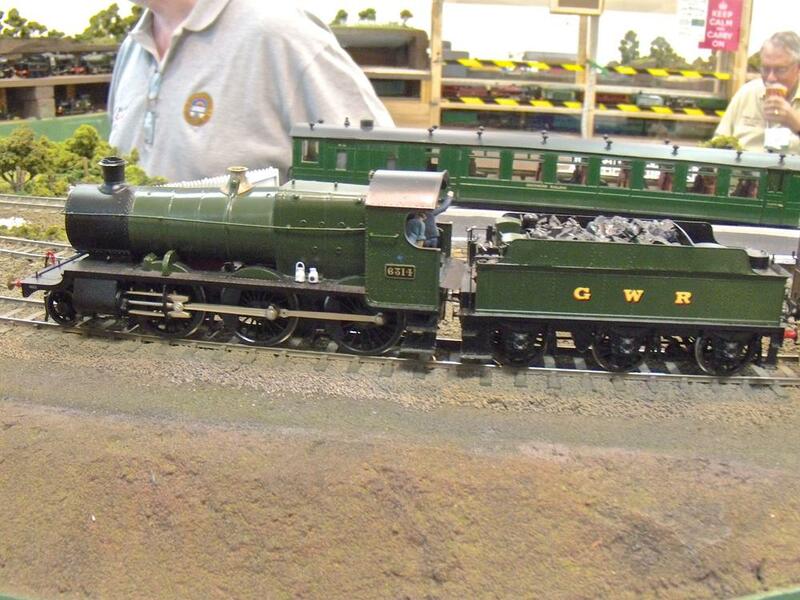 Here are some photos of the O gauge display at O Scale West in 2010. At McDonalds, there is 1/4 pound on scale before cooking ....oh .. 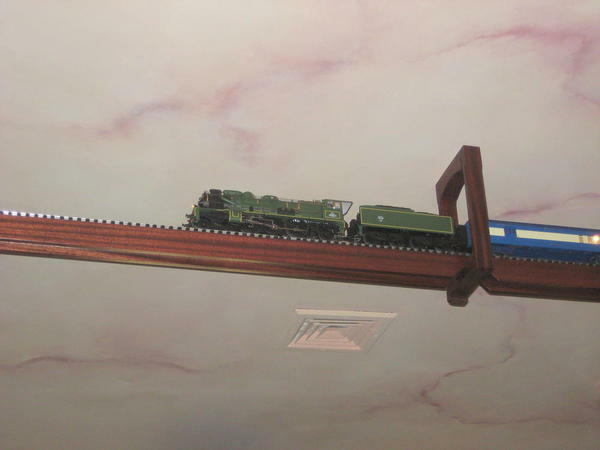 The Flying Hamburger is two rail 0 scale by Kesselbauer of Germany. There were approx. 15 sets produced. I added the interior lighting and needed new casting for the trucks as the originals just did not stand the test of time. This is one of my best all time pieces. Yes,I've got Fleischmann and Marklin HO from the 60's and 70's. I also have a small collection of modern Marklin I gauge. 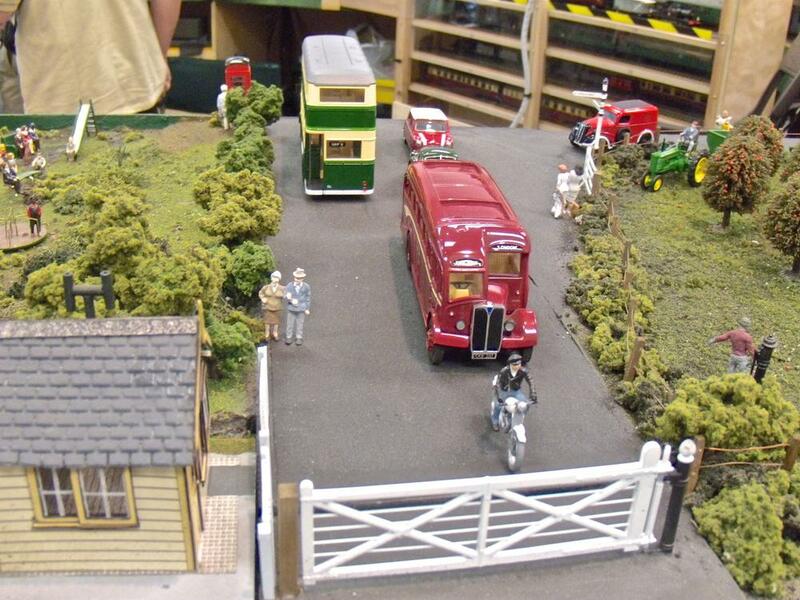 I've bought some of the MTH O gauge items. I travel to Germany a lot on business and always attend a train show or two and always visit the incredible train shops. Trains are much more popular and visible than in the US. Every German toy shop has a massive model railroad department. It's a whole different world and I like it! I own plenty of European O gauge/O scale models from Rivarossi/Lima, Lenz and other manufactures. My focus is on Continental European, but not necessarily Central European nor Alpine. Some of the European rolling stock and motive power have been converted from 2-rail to 3-rail, because on Gargraves tracks I can run both systems. Additionally my collection of scratch-built European passenger coaches is growing exponentially. Recently I made a 40" long monumental station building with classic Herman architecture. If someone is interested I can share here few video links dispaying my European trains. I have a Rivarossi German diesel and coaches, and a Pola-Maxi steam 0-6-0T with several freight cars. I also have a number of Marklin HO engines & cars. 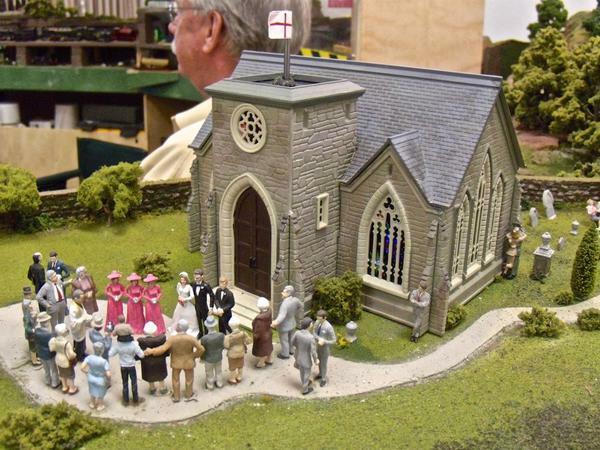 I used to have a OO gauge British layout but I sold all my stuff when we got into 3-Rail O gauge. My youngest son has a few Hornby OO gauge engines such as Flying Scotsman. We also have the Lionel Hogwarts set and Thomas, Percy and James. I would like to see a Lionel Legacy LNER Mallard. I could go with a ACE or Darstead model. 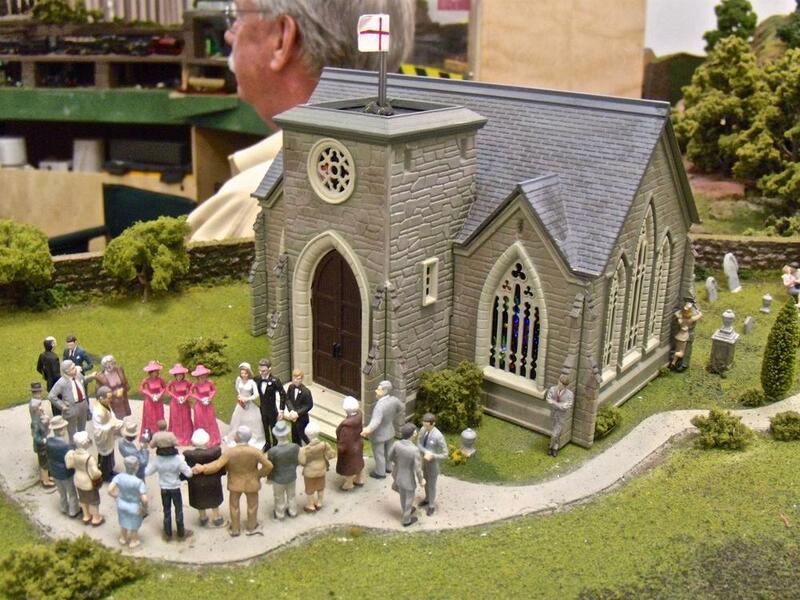 It would be nice though to see what Lionel could do after the nice GWR Hall. If someone is interested I can share here few video links dispaying my European trains. I think many of us would enjoy that. Are there any models of Finnish trains, preferably in 0 scale but if not, in any other scale? I don't think I have ever seen any - maybe Marklin or Fleischmann makes them? I've ridden trains in Finland but never seen any models. I took the auto carrier train once up to Rovaniemi and drove back to Helsinki in my Calibra. The Rautatieasema (Railway Station for the English speakers) in downtown Helsinki is one of my favorite places. I used to walk around the shops a lot. There were some good music shops where you could get a nice variety of Finnish rock and roll. My favorite Finnish bands are Leningrad Cowboys, Kolmas Nainen, Hanoi Rocks, Hurriganes, The Flaming Sideburns, Freud Marx Engels & Jung, Lapinlahden Linnut, Hassisen Kone, and Eppu Normaali. When I was living in Helsinki they also had some great rock and roll TV ads for Koff beer. By all means post your videos. I have an ETS set that gets running time on the Seattle & Yakima RR. You must forgive the lack of a tender but here is the most aged engine I have. A Bing 0-4-0 pulling some Hornby with floral wire. I also have an ETS set, some Exley coaches, Leeds M C and Bassett Lowke. I have some MTH LMS coaches and several Lionel Shakespeare Express and Hogwarts sets. I have yet to get the Albert Hall set but I don't like the lighting set up on the engine it is closer to Hogwarts than Shakespeare. I do really like this stuff and and am on the look out at train shows most people have no idea what it is or is worth I have found. Boomer, since you are familiar with German railroad models, I'd like to ask if there is much available in O scale German narrow gauge. I've always been fascinated by the German NG lines. I messed around with 2-rail O small-prototype British scale for years, and still have several items of rolling stock that I wanted to keep. The layouts were a typical Brit small-space branchline theme. Continuing in European O scale or HO scale is such an expensive proposition these days, that even Lionel Vision Line prices look attractive. It's no surprise that the vintage Euro market seems pretty busy on that auction site. Over the years I gradually became more tinplate collector-ish, then got myself a Polar Express 0-27 set , then a Lionel docksider, then a MTH EP5, and now enjoy the electro-mechanical chunkiness of modern North American 3-rail. Operating barrel cars don't go well on sleepy British branchline layouts. My current European interest is chasing down Marklin HO catenary wire to run my EP5 under, as per our helpful forum member's ideas. If there's a layout that makes me want to drop everything and go Euro, it's this one, even though the locomotives are miraculously running with pantographs down. Are there any models of Finnish trains, preferably in 0 scale but if not, in any other scale? Among other European O gauge projects myself I am designing currently Finnish passenger coaches (pikajuna, intercity) and Russian passenger coaches (RepinExpress, TolstoijExpress, TransSiberiaExpress) as frequently observed on the Helsinki Cetral Rwy.St. I have the Lionel Hogwarts (want another one in green) and also have an MTH Crocodile. I like it enough I'm looking at the new versions (more like a box) that MTH came out with this year. I added MTH European passenger/baggage cars to make it 7 cars long in multiple but complimentary paint schemes. I have LGB outdoors in European style. I enjoy the contrast to my Lionel O Gauge postwar and the newer TMCC/Legacy era trains. Here's what I'm working on this weekend. On the below video you can see a 2-rail DC analog operated Lima/Rivarossi train and another 3-rail AC conventionally operated train consisting of a converted European diesel and scratch-built EuroFima type passenger coaches of various European state railways. The coaches can be equipped with MTH truck and 3-rail couplers or with Atlas trucks and Darstaed/ACE/Merkur-compatible metallic hook couplers (alternatively also with plastic Lima/Rivarossi-compatible "Buck Eye" couplers). I prefer 42cm length for my scratch-built projects, because the express trains looks sufficiently realistic while pulling 7 coaches. The Finnish loco looks great. That was the one I found myself waiting to see again, and again, each time it came around. Fleischmann had a line of On30 trains, their Magic Train line. Unfortunately I have heard that it has been discontinued, but they can still be found on German Ebay. I have a nice little side rod diesel switcher from them, and I might get the little 0-4-0 steamer that they did. These smaller narrow gauge trains are often called Feldbahnen. There are also some models of Swiss meter gauge Alpine trains out there. Back in the 70's Marklin had a line of AC powered On30 trains running on their center stud rail track. Pretty hard to find those though. you can see my Finnish scratch-built flatcars and logcars for wood/pulp industries. On the 10th page of the same catalog you will see my self-designed covered freight cars of the Finnish state railways. you will see the same type of covered freight cars, which have been vandalized to display modern Finnish era. I have modeled British-themed layouts for years - having built up a fairly large Island of Sodor and more recently, the Merioneth and Llantisilly Railway Traction Company Ltd. located in the 'top left-hand corner of Wales.' (based on the BBC TV episodes of Ivor the Engine. They are great fun! You do some incredible work. Its hard to know what is, or isn't hand made without knowing Rivarossi work too. Your posts are the only clue really. Bravo! Not yet, but I'm tempted. Even if I don't, if MTH does the Mercibox car set -- 48 cars (one per state) from France in gratitude for US-Led liberation in WW2 -- I'm buying them. MTH has a compatible box car that's very close. They could be done in eight blocks of six cars.